One of the greatest riches of the region is the concentration of places to renew the faith, mainly Churches that represent ideal destinations for its architecture and sacred art. Among the most important destinations of faith there is, for example, la Capilla de La Magdalena (the Chapel of La Magdalena), one of the most relevant sites for Michoacan and Mexico. 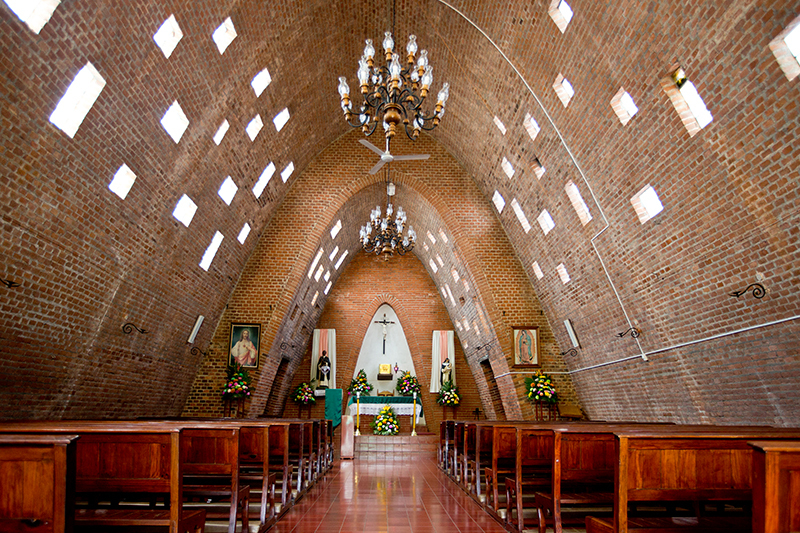 Built in the 16th century, it was the first chapel of the region, a place where the diocese of the Augustinians began their evangelization and the subsequent founding of Tacámbaro; The Chapel of La Magdalena is, by itself, the cornerstone of the city ever since the urban spot began growing around its building. It was lost in time until 1983 when experts in history and architecture rediscovered the place and began a restoration work that lasted until 1998. Built In a Plateresque and Baroque style, the Chapter of La Magdalena is a jewel of New Spain history that nobody should ignore. Another important destination is “el Templo de la Virgen de Fátima” (the Temple of Our Lady of Fatima), a work of modern architecture whose construction began on March 29, 1952 and culminated on October 26, 1967. This sanctuary houses the refugee virgins of the old regimes in Poland, Hungary, Cuba and Lithuania; also an additional one from Coromoto, Venezuela which is not open to the public. In the basement of the sanctuary there is a built replica of the Holy Sepulcher of Jerusalem , one of the main attractions of this church. It also has a beautiful stained glass window of the Virgin of Fátima which makes it one of the most visited temples by inhabitants of the area and tourists. Another of the most important destinations in Tacámbaro is the cathedral which was under construction between the years 1538 and 1567. Over the centuries it has not only witnessed the growth and evolution of the city, but also its own partial destructions. It has suffered fires and restorations that have shaped its appearance to this day. Now it has a style from the late 19th and early 20th century. Among the main attractions of the sanctuary there is a bronze altarpiece located in the tabernacle that represents the throne of God. Finally there is “el Templo del Hospital” (the Temple of the Hospital), named after the community centers instituted by Don Vasco de Quiroga, also founded by the order of the Augustinians in 1538. By today, only the chapel is in service, where the immaculate conception is venerated adding its cult to the festivities of the town every December. The religious tourism in Tacámbaro has numerous bastions that make it an ideal option to renew your faith or increase your knowledge of history. The European influence on the architecture and the art of a magical village is an example of the cultural fusion that characterizes our country, something that has shaped the cultural legacy of our cities. 1 Is an initiative led by SECTUR, in conjunction with other federal and state agencies, to promote a series of towns around the country that offer visitors a “magical” experience. Do you already know these places? Come to Tacámbaro, ask for these and other destinations at Quinta Sauz Hotel & Spa!